Air Mail is a warm apple cinnamon muffin, right out of the oven! Just the right balance of crisp apple, warm muffin, and a luxurious cinnamon finish. Note: Max VG liquids do not work well in CE4s and other plastic clearomizers. We try to keep 120mls in stock, however to avoid any delays you may receive 4 30ml bottles instead of a 120ml. Introducing the New & Improved Lindbergh line! Our liquids have been enhanced to provide a brighter, more flavorful vape. Each “Steamer Trunk” box holds a 30ml of your chosen flavor! This is one of my new favorites. The flavor is great! I wasn't too big of a fan of the air mail. It tastes exactly like the description said but it was just so damn sweet. I was hoping it wouldn’t be as sweet but I can see why it would a fan favorite to others. Cinnamon apple muffins are one of my favorite things to eat. I love anything with cinnamon and I love apples. Lindbergh was so spot on I could not believe how accurate it was. Just like eating a real freaking mufffin!! Perfect for halloween time. It is just really fantastic and packed with so much flavor. I love dripping this one in my RDA. It is not harsh at all, doesn't mess up my cotton, an tastes like heaven. I am obsessed with this flavor. It's unlike anything I've tried before. Typically I've only tried like sweet candy flavored ones. But this one tasted just like described and the apple was to die for. This really tastes like actual food rather than an artificial extract of the food so i'm trying o get as much of it as I can. Great muffin flavor. Reminds me of the cinnamon apple muffins they sell at Costco. I seriously always pick some up whenever i stop by there and these are just like those. Lots of sugar, cinnamon and apple. The Cinnamon and Apple is very rich and heavy in this e-juice. But I do like it because it is sweet and not harsh when vaping it. I would recommend this one to any one who likes dessert and apple flavors. This flavor is so far my favorite. Apple cinnamon is my Achilles heel. Such a warm sweet taste with a dry muffin feel. I've tried the other Lindbergh juice and this is the best one. Tastes just like it says. 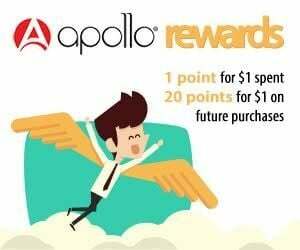 I will be looking forward until the next time Apollo gives a discount of these juices for sure. Never before have I tried a flavor that tasted just like and even better than described. I just got a 30ml bottle to try it out and it is delicious. It definitely tastes dry like a muffin and not damp like a pie so they nailed it. I'm down to the last bit of the bottle and I'm still not tired of it so I'm definitely loving it. Will have to buy more soon. These liquids were on sale so I gave it a shot and I'm so glad I did. The description said Apple Cinnamon Muffin but I found it more to taste like a cracker. The best I could compare it to was a Dunkaroo without the sugar glaze dip. I loved it because I ate those all the time as a kid. So it tastes like nostalgia. I don't know how they make a liquid taste dry like a cracker but they nailed it. Buying again fo sho. This flavor is perfect for Fall. Everytime I vape it I feel like it's fall because its just so cozy and comforting. It is sweet but not too sweet. The apple and cinnamon are a huge hit for me. And because it's a muffin it is a great dessert vape. I highly recommend this one. The flavour just stays with you after every exhale!!! Amazing combination and layering of flavours. By far my number 1 choice as an all day vape! First experience with Max VG liquid. Must say I made the perfect choice for the perfect liquid. Outstanding in every sense. I've been vaping New York to Paris for some time now as I consider it the perfect all day vape. Intense, rich, perfectly balanced fruity vape. Just wanted to congratulate you on the new packaging...it looks really great and adds a premium feel to it!